Ridley Scott’s 5-time Oscar winning film Gladiator has been dated for release on 4k Ultra HD Blu-ray. The new 4k edition presents the film in 4k (2160p) for the first time, with HDR for added color depth and luminance. The 4k Blu-ray includes an English DTS: X soundtrack, as well as English DTS Headphone X and English Audio Description. Special features on the 4k Blu-ray edition include an Introduction by Ridley Scott (Extended Edition), audio commentary from Scott and actor Russell Crowe (Extended Edition) and audio commentary from Scott, editor Pietro Scalia and cinematographer John Mathieson (Theatrical Edition). The is also plenty of previously released bonus content on the Blu-ray disc (included in the combo) such as deleted scenes, abandoned sequences, and The Scrolls of Knowledge. 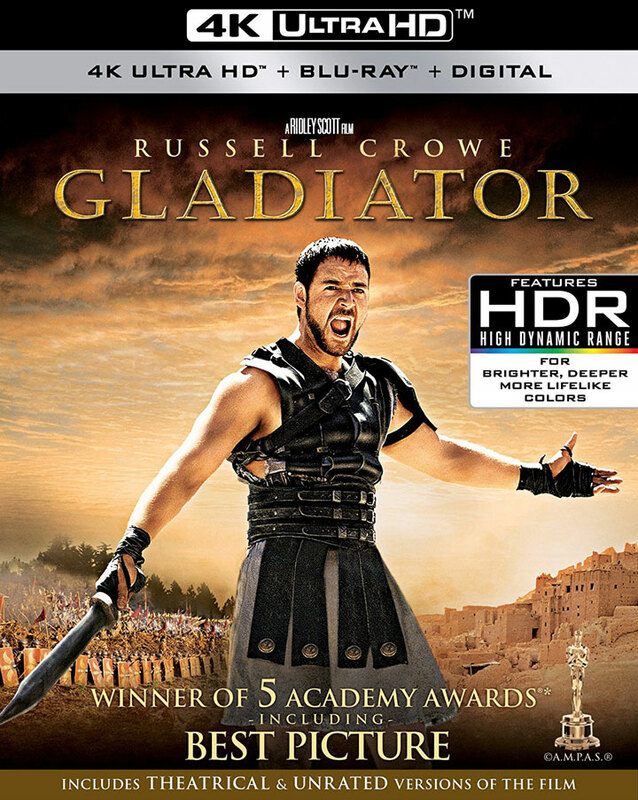 Gladiator on 4k Blu-ray carries an MSRP of $31.99. Pre-orders are currently selling on Amazon for $27.05.